The "Petit" means small, the Boutique concept derive from a most significant remaining Khmer architecture in the world of Angkor Wat Temples built in 4 icon: earth, water, fire, air. 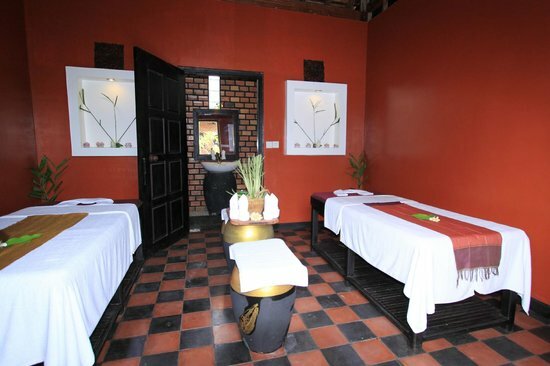 The Petit Villa Boutique & Spa is a place where you are treated so well, yet with un-condition of care. Offers each resident a privilege of exceptional Khmer cultural experience that is intimate and discreet while providing a highest level of service as a truly Khmer hospitality. A great Khmer Hospitality is told by the Great Khmer People. Offers each resident a privilege of exceptional Khmer cultural experience that is intimate and discreet while providing the highest level of services as a truly Khmer hospitality, A great Khmer Hospitality is told by the Great Khmer People. A careful design of its uniqueness of 7 suites room characteristic has been carefully built in recognition of how individual traveler needs while on journey to the world heritage such as Angkor Wat, Banyon, BanteaySrei, Rolous group, Ta Phrom temple where it is known as the Kingdom of Wonder, Cambodia- Kampucha. A spectacular interior and exterior design and the atmosphere of this little paradise will surely make your stay at the Petit Villa Boutique & Spa the most memorable experiences in the South East Asia. Set in a lush garden enclosure, a thoroughly Khmer Art decor glows with the touch of its 60s conceptual. The concept of Khmer is unique where it is hard to preserve and put into practice without knowing the route of cause, and you will realize that nowhere else has such a wonderful work; yet, the Petit Villa Boutique & Spa has it all. Particularly, you will recognize the home-grown product hardship which puts into live to enable every resident a touch and a personal care. 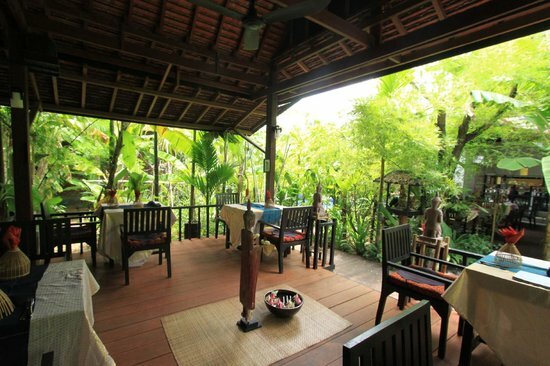 This tranquil villa offers a multitude of relaxing opportunities within its Petit garden, swimming pool surrounded by bamboo tropical garden, jasmine flower, frangipani, Champa flower with shaded trees for alfresco delights; the Champa Cafe offered a wide range of Khmer cuisine and Western alike. The 7 suites are decorated in a classic Khmer contemporary, pristine white, dark Khmer tile with private balcony, high ceiling and a Khmer contemporary bathroom design reminded of 60s conceptualized architecture. Champa Café, all-day dining, everything on the menu is home-made product on the premises, surrounded and shaded by trees, near theswimming pool, is a focal point of the property and unique in its design. 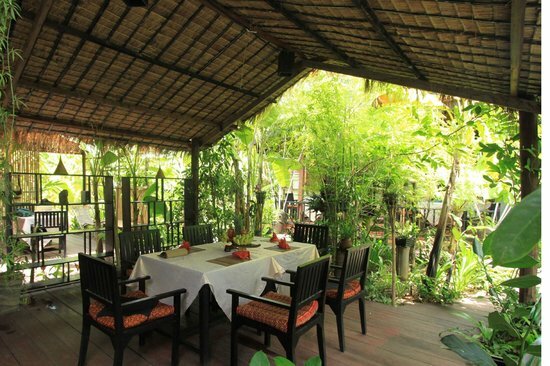 It is circular in shape with a typical Khmer design and has an open-air ambience for dining or all daylong. 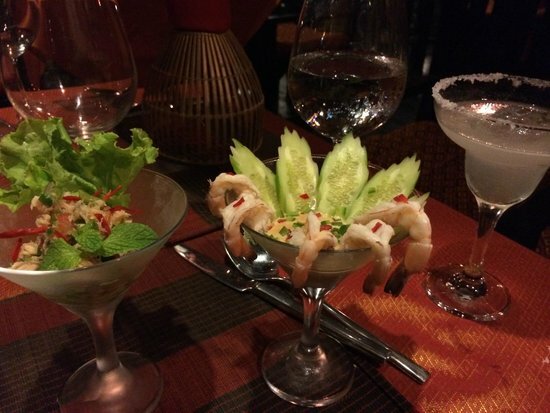 The Café menu offers traditional Khmer and Western cuisines and features the freshest of home grown produce. Resident may also dine and snack at the Champa Cafe, or enjoy their room verandas complimentary mini-bar that offers a range of healthy alternative Khmer herbal drinks as well as the usual favourites. Champey Bar, all-day dinning, offers a seasonal alternative spot for early evening drinks or Khmer light-fare, with cushioned seating and shaded by trees near the petit swimming pool, is a focal point of the property and unique in design and has a beautiful ambience surrounded by jasmines flower for dining or all day relaxation. The selective drink list features the freshest of seasonal produce where resident may make their selection. Resident may also dine and snack pool area, or enjoy their in suites complimentary minibar that offers a range of healthy alternative herbal drinks as well as the usual favourites. Malis Spa, Overlooking the Khmer-inspired swimming pool which has an immaculate treatment rooms in red & white Khmer tile, focusing strongly on therapeutic Khmer techniques using organic products. A peaceful haven of tranquility, experience the luxury of complete serenity and restore your sense of wellbeing. A light and healthy fresh Khmer herb offering as refreshment on complements all of our Spa Packages. 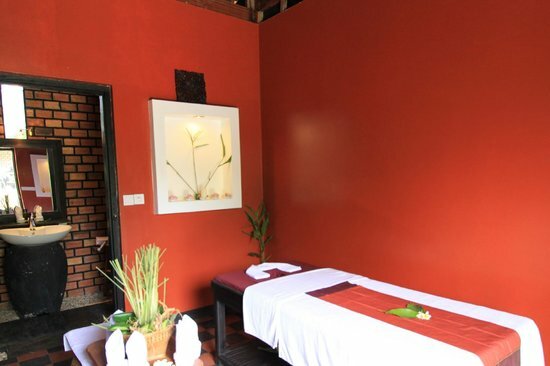 Allow the Khmer traditional treatments and therapies to awaken your senses upon tiring from sightseeing. The Khmer art of healing involves applying pressure to the body's energy meridians. Release built up tension, improve blood ï¬‚ow and free your body of toxins that gather in tired or overworked muscles. Calming, healing properties of white clay with lavender, and vitamin E help to eliminate toxins whilst healing and soothing the skin. Known for its anti-inï¬‚ammatory effects, this wrap is recommended for dry and reactive skin. Natural ingredients of rice and tamarind are used to exfoliate, nourish and tone the skin while stimulating circulation. The health beneï¬ï¿½ts of honey have long been well known, and in this instance, encourage the growth of new cells. Petit Swimming Pool Surrounded by greenery and palm trees, lie back on a comfortable bamboo sunbed, with cushions and lighting, perfect whatever the weather. Our friendly wait staff will be happy to assist you with drinks. A 15m by 5m lap pool is also available closer to the suites. The 7 suites are decorated in a classic Khmer contemporary, pristine white, dark khmer tile with private balcony, high ceiling, a khmer contemporary bathroom design reminded of 60s conceptualized architecture.